Welcome to the The Galant Center. For all you tech heads, enjoy! Hack away at your vehicles factory ECU. More power, is always better! Tutorial and important information for all generation Galants and general automotive. Post topics regarding turbos, supercharges and nitrous in this forum only. This forum is for all Galants. Post all Q&A's regarding wheels & tires (including offset Q's), brakes (rotors, big brake kits, pads, etc. ), and suspension (struts, springs, etc.) in this section. Car audio, security alarms and gadgets, radar detectors and other auto electronics. Give your feedback and ask your questions in here. Know of something that'll make your car shine? Something that'll stop that pinging from your engine? Post your Q&A's in here. 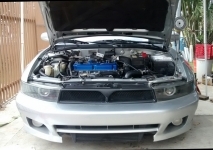 Please post general questions and answers pertaining to the 7th Gen. Galant in this forum. No Off Topic posts. If you're experiencing problems with your 7G Galant, post your question in here and receive an answer. Most users ever online was 734, 02-21-2014 at 03:42 AM.